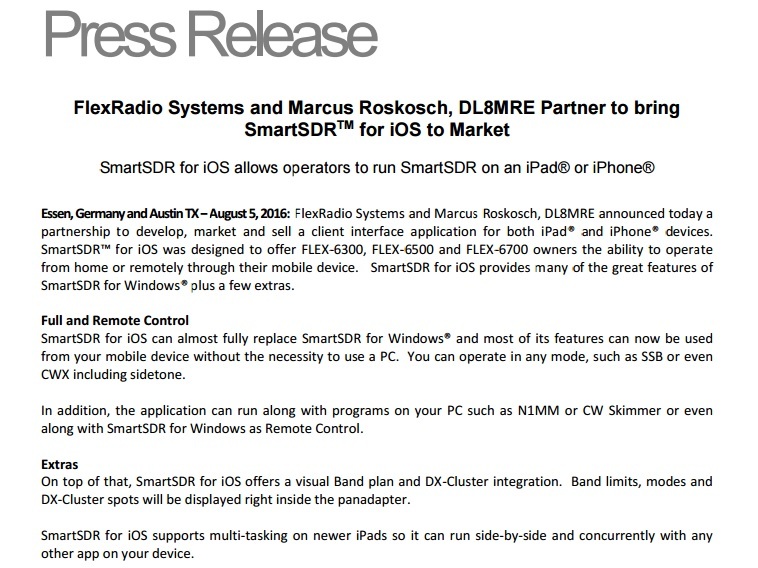 FlexRadio Systems and Marcus Roskosch, DL8MRE announced today a partnership to develop, market and sell a client interface application for both iPad® and iPhone® devices. 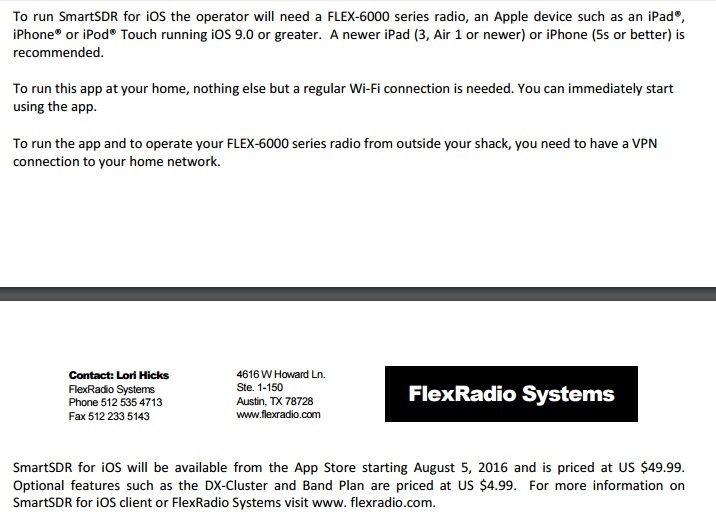 SmartSDR™ for iOS was designed to offer FLEX-6300, FLEX-6500 and FLEX-6700 owners the ability to operate from home or remotely through their mobile device. 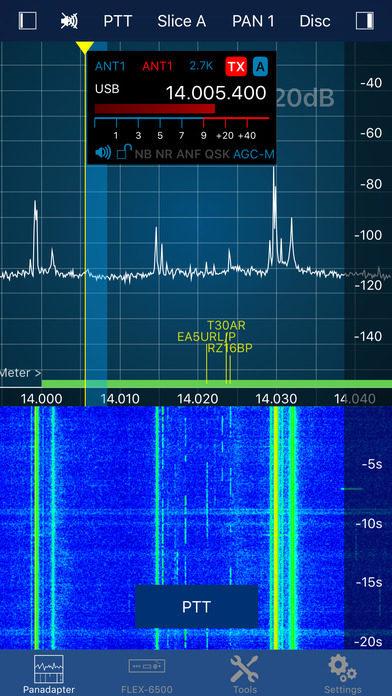 SmartSDR for iOS is a full featured radio client that enables your iPad or iPhone to operate your FlexRadio device. 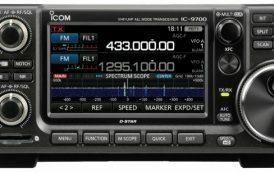 Please note: This App requires a FlexRadio Systems® Series-6000 Software Defined Radio (SDR) Device. However, the App also contains a FlexRadio simulator (Demo Mode) so you can try this App even without owning a FlexRadio. ■ Graphical tuning knob for easy and exact frequency selection. ■ direct Bandwidth selection, Split Mode, instant Memory creation and more. – Only one Panadapter visible at the same time. 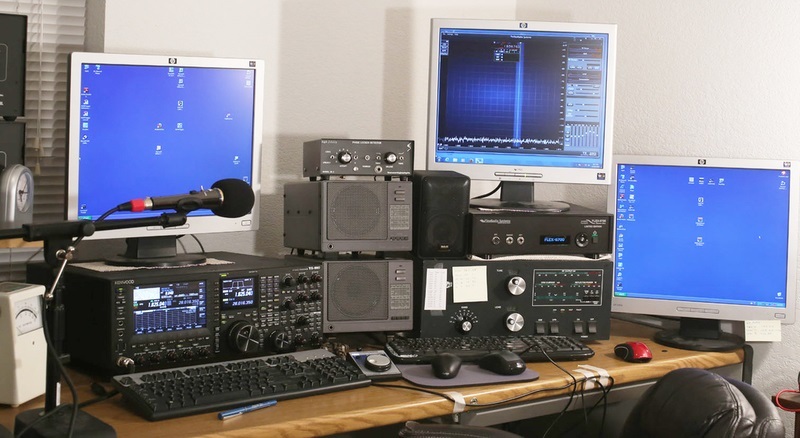 – Diversity, Full Duplex and Transverter support are not yet implemented. To run this App at your home, nothing else but a regular WiFi connection is needed. You can immediately start using the App. your FLEX-6000. You can immediately start using the App. Remote operation requires a VPN connection (VPN software and hardware not included). The App supports Multitasking on the newer iPads so you can run SmartSDR for iOS in split mode parallel to your browser, Email software or any other App. It is also optimized for the new iPad Pro models.